Three critically acclaimed films that will soon be shown in the Philippines are expected to reap honors in the 75th Golden Globe Awards on Mondaymorning, January 8. 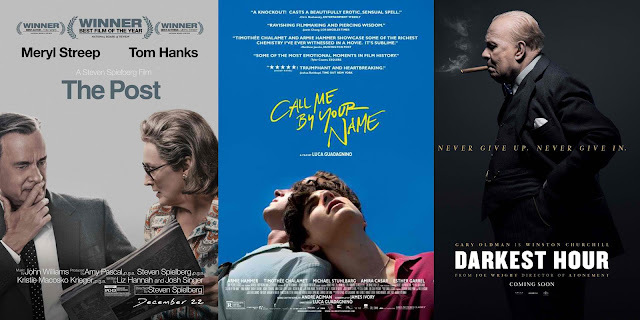 They are Steven Spielberg's The Post, Luca Guadagnino's Call Me By Your Name and Joe Wright's Darkest Hour – all distributed locally by Columbia Pictures. Starring Tom Hanks and Meryl Streep, The Post tells of a cover-up spanning the terms of four U.S. Presidents that pushed America's first female newspaper publisher and a hard-driving editor to join an unprecedented battle between journalist and government. Meanwhile, Call Me By Your Name, the gay romantic drama set in Northern Italy in 1983, is the story of seventeen year-old Elio (Timothee Chalamet) who begins a relationship with visiting Oliver (Armie Hammer), his father's research assistant, with whom he bonds over his emerging sexuality, their Jewish heritage, and the beguiling Italian landscape.